for TNPSC VAO Jobs will be available soon on the official website of Tamil Nadu PSC @ www.tnpsc.gov.in. Last date for TNPSC application process is September-2017. Individual will be offered monthly pay scale of Rs. 5200/- to Rs. 20200/- plus Grade Pay Rs. 2400/-. 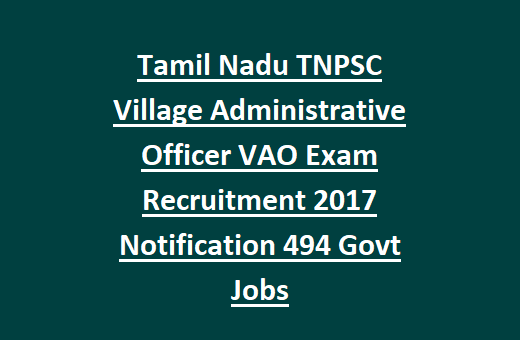 Selection of candidates for TNPSC Village Administrative Officer Jobs is based on Objective Type Written Examination. Written exam will be conducted for 300 marks. Minimum qualifying marks are 90 marks. Candidate should have Maximum age of 30 years and minimum age should be 21 years. Tentative date of written exam will be held in 11-February-2018. Check the details about selection process, Application procedure, application fee, Age details, Salary of Tamil Nadu Public Service Commission TNPSC Village Administrative Officer Jobs Recruitment Exam are given below. Available vacancies in TNPSC Recruitment are 494 posts, which are going to be filled through Tamil Nadu Competitive examination. Post Name: Village Administrative Officer (VAO): 494 posts. Department Name: Tamil Nadu Public Service Commission TNPSC. Candidates applying for VAO Jobs in TNPSC Recruitment will be offered monthly salary Rs. 5200/- to Rs. 20200/- plus Rs. 2400/- Grade Pay applicable as per Tamil Nadu Govt norms. Candidate should have minimum age of 21 years and maximum age should be 30 years for unreserved category. Relaxation in age applicable for reserved category is 10 years according to the Tamil Nadu govt rules and regulations. Please check the TNPSC notification for more relaxation details. Qualifications required for VAO Jobs is SSLC (12th) certification or equivalent qualification from recognized University. Applicant must have knowledge in Tamil language. See the TNPSC Notification for qualification information. 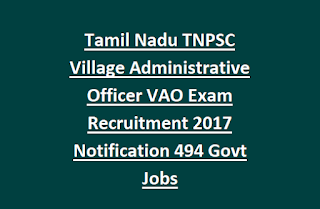 TNPSC Village Administrative Officer recruitment selection is based on Objective Type Written Examination. Written Exam (Objective Type) will be conducted for 300 marks. Time Duration is 3 hrs. Minimum qualifying marks for selection is 90 marks. One Time Registration Fee is Rs. 50/- and Examination fee is Rs. 75/-. Interested candidates read the terms and conditions before applying for TNPSC VAO Jobs. Log on to Tamil Nadu PSC official website www.tnpsc.gov.in. Open the recruitment link and fill the application form. Enter the all details. Submit the application form with recent photograph and signature. Recheck the TNPSC application form and submit before last date. Last date for TNPSC Application forms is 13-December-2017.